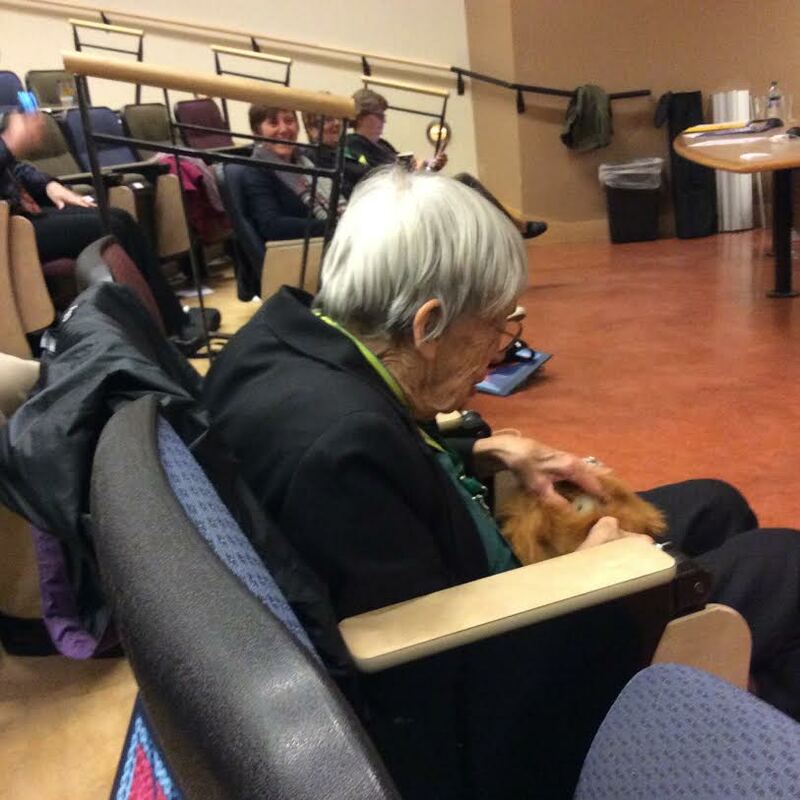 Seeing a photo of Ursula K. Le Guin holding a tribble at the Tiptree Symposium piqued my curiosity. David Gerrold was at the event. I sent him an email asking if he gave it to her, or if he knew the rest of the story? I had tribbles there, but I didn’t give her one. I would have if I’d thought of it. I suspect Linda Long or one of the other organizers might have shared a tribble with her. If there’s more to it, I don’t know. We had brunch yesterday morning and nobody mentioned it. 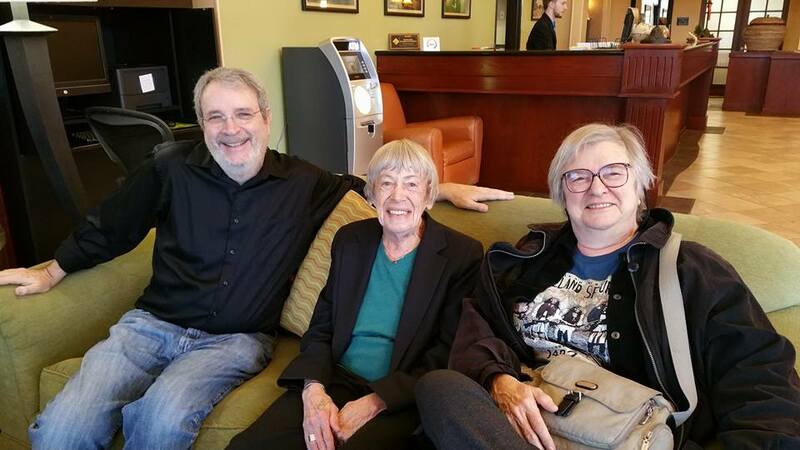 David Gerrold, Ursula K. Le Guin and Suzy McKee Charnas at the Tiptree Symposium. Photo used by permission. I turned the question back to Jeffrey Smith, author of yesterday’s Tiptree Sympoisium report. He had the answer and an even better photo. That tribble actually belonged to Carol Stabile from the [University of Oregon]. That’s her in the center of this picture, just across the aisle from Ursula. Carol had two tribbles, which I assume she bought from David. Carol and Ursula were trying to make them purr. Ursula K. Le Guin holding a tribble. Photo by Jeffrey Smith. This entry was posted in Conventions and tagged Ann Smith, David Gerrold, Jeffrey Smith, Suzy McKee Charnas, Tiptree, Ursula K. Le Guin by Mike Glyer. Bookmark the permalink. I remember the huckster at LACon II who was busy selling individual M&Ms next to Gerrold’s booth selling Tribbles. He had them labelled as Tribble Turds, and he couldn’t keep up with us. I know I bought several myself. I don’t where the tribble came from that Ursula had at the symposium, but it’s not her first tribble. She donated one years ago for a charity auction at OryCon for the Susan C. Petrey Clarion Scholarship fund. Ivestigative journalism. – Well, it does not have to be too serious. I prefer this tribble fun over all those political statements. Thanks Martin — you are hereby annointed File 770 Hero Proofreader of the day, with all rights and privileges appurtaining thereto. A photo of UKL attempting to get a tribble to purr is delightful. Only on File770 does this sort of thing happen.